Would you like to slow down and spend some quality time with your stitching? 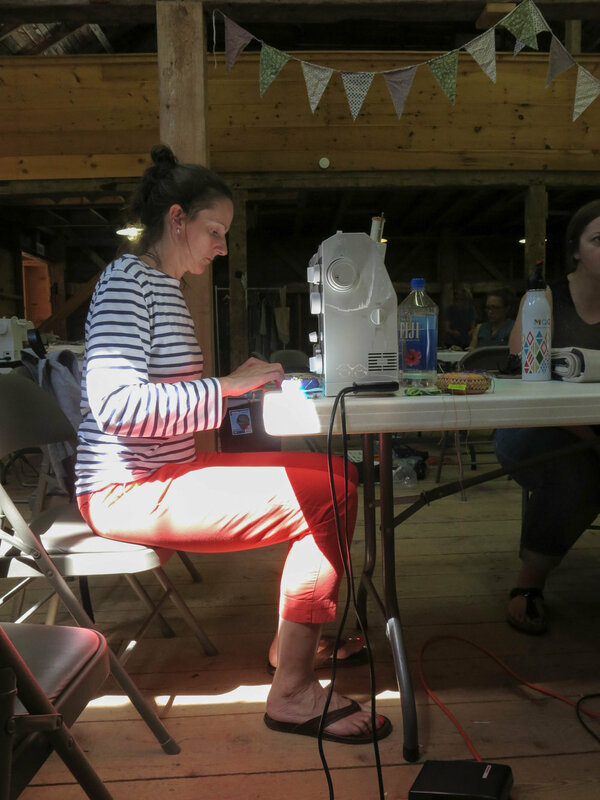 Maine is a beautiful place to turn down the volume, shut off the email, leave the phone in your room, and spend some time with a needle and thread. This year three world class sewists and makers: Chawne Kimber; Denyse Schmidt; and Maura Ambrose, will share their time, their stitches, their color, and their spirit with you for five days in Washington, ME, August of 2017. 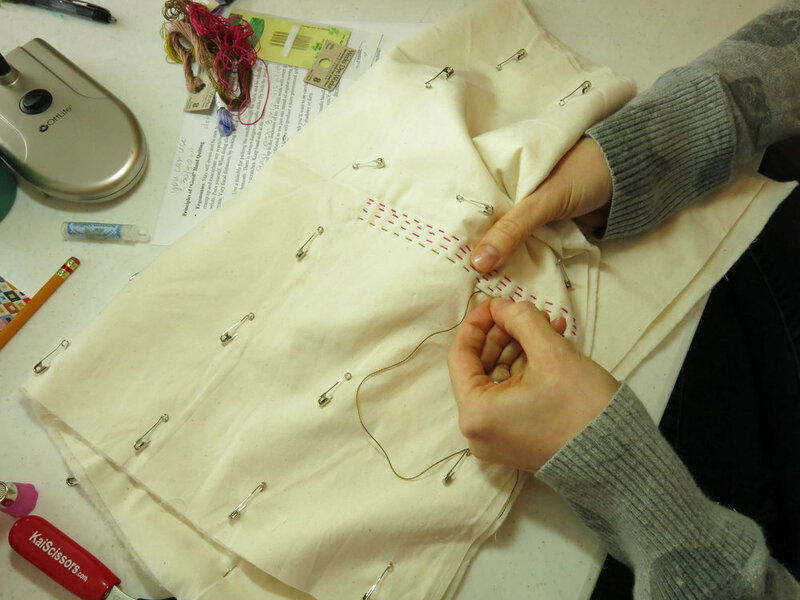 ~Denyse will be teaching hand sewing. "The women of the Hawaiian Islands developed a uniquely bold style of quilting characterized by large, stylized botanical motifs. Learn to create your own variation of a Hawaiian-style appliqué based on plants or flowers we collect on a lovely Maine walk, or your own style of doodling; and work toward mastering my favorite needle‐turn appliqué method. I’ll guide you through drawing your design, or working with the motif featured in my second book (Modern Quilts, Traditional Inspiration), cutting and basting your motif, and teaching you the meditative and portable method of needle‐turn appliqué. Plan on making a baby or wall‐hanging size quilt 42 inches square, or create a small piece to (possibly) finish during the week." ~Maura will share her knowledge of dyeing with natural materials. "We'll focus on the basics of natural dyeing. We'll discuss harvesting, growing, and sourcing materials, and the basics of setting up a dye kitchen. I'll share my process for preparing fabric for natural dyeing and discuss the benefits of mordants. We'll experiment with a variety of natural sources including indigo, madder roots, and osage wood chips. 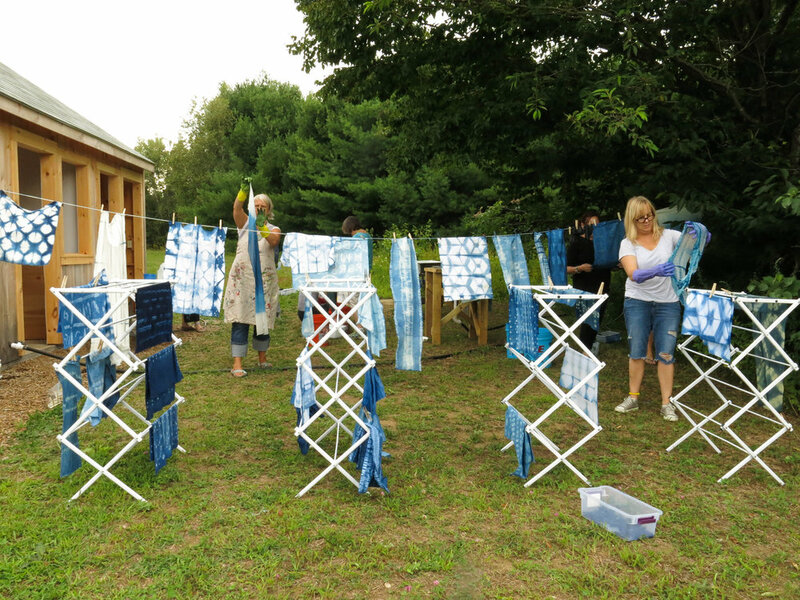 We'll explore a variety of shibori and other resist techniques used for creating surfaces designs. I'll do some demonstrations and then we'll all dive in. We'll have plenty of time for discussion, questions, and reveling in the magic of natural color." Denyse Schmidt has been making quilts as a commercial venture since 1996. A former graphic designer and graduate of Rhode Island School of Design, Denyse has helped to change the way we think about quilts. Intrigued by the rich historical nature of quilts and inspired by beauty born of necessity, Denyse adds her distinctive aesthetic sensibility – clean, spare lines, rich color and bold graphics – to this rich art form. Though firmly rooted in the techniques of American quilt-making, Denyse is renowned for her fresh, offbeat approach to design and color and has won acclaim from the worlds of art, design and craft. As author of Denyse Schmidt Quilts (Chronicle Books, 2005) and Modern Quilts, Traditional Inspiration (STC Craft, 2012), fabric designer for FreeSpirit , and teacher of a series of popular improvisational patchwork piecing workshops – Denyse continues to inspire with her witty take on tradition. Denyse’s studio is located in a historic factory building in Bridgeport, Connecticut. You can find more about Denyse on her website. Maura regularly shares her creative process with thousands of Instagram and Facebook followers and teaches workshops on her woodland property outside of Austin. Maura's website is here. Registration includes lodging in a cabin with one roommate, all meals, and all instruction for five days. The cabins are rustic and spare, but modern and comfortable. There is a limited number of private cabins available for an extra $200. Let me know quickly if this is your preference. If you are coming with a friend, just let me know when you register and I'll put you in the same cabin. We can accommodate most dietary restrictions within reason, just alert us to your needs in advance. Otherwise, all you have to do is get yourself here, I'll take care of the rest. I will send out recommendations for what to wear and bring in advance. The food at camp is simple, wholesome, and satisfying. Please notify me of food allergies, or if you are Vegetarian (specify if you do/do not eat dairy, eggs, fish, etc…) , but we suggest that unless you have a specific condition, you will find plenty to nourish you during your time at camp. In order to give you plenty of time to check, and double check, your schedule, and confer with partners, bosses, children, parents, and pets, to make sure this will work for you, I delay the opening of registration. You will be able to register on Monday March 5th at 3:00pm EST. REGISTRATION OPENED AND ALL SPOTS ARE NOW FILLED! If you would like to be put on a waitlist for any possible openings email me.... Thanks to everyone who so enthusiastically sign up!